Native Marketing is a form of online marketing. It is widely practised by websites that generate large traffics, it is a process where trust and brand awareness is built with the loyal readers of the web site. It basically entails the subtle placement of text and graphics that highlights the benefits of a business. At MYP native marketing is something which we have a very keen eye on. 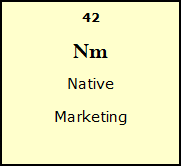 Native marketing may also be in the forms of videos, images, images, articles, commentary, music or other media. It is a method to place your product and service in the mind of your target audience while they are enjoying an article, a video or looking at an image. We can do Native Marketing at MYP with our extensive network and our blog to benefit your business or agreed targets. In our technology driven world, it is essential to make use of all online tools which you can use and have an edge over others. Marketing is no longer the traditional marketing that it has been 10 years ago. It has evolved and native marketing is one of its outcome.